I was obsessed with baseball as a kid. I think the reason baseball hooked me, and not some other sport (like hockey, which I was expected to be obsessed with, as a good Canadian) was all the stats. A certain type of pre-nerd just can’t resist comparing favourite players by batting average, generating all-time lists of RBI leaders, or scanning a complete set of baseball cards to see who has the lowest ERA. There was also the lure of baseball cards themselves. In addition to stats, they had things like birthdays printed on the back, and I still the recall the very real thrill of discovering that Jack Morris and I shared a birthday. The other thing was all the history. It hasn’t been around for all that long in the grand scheme of things, but baseball is certainly the most historical-feeling of the North American pro sports. When I was about 10, I wrote my very first book — a legitimately long (50 pages or so) and detailed (I remember an entire chapter on Stan Musial) history of the sport composed in pencil on ruled Hilroy paper. My obsession was rewarded in an incredible way in 1992 and 1993, when the Toronto Blue Jays, my home team, won two World Series in consecutive years. I was 11 and 12 at the time, and I cannot overstate how totally exhilarating it was to see my team win. But then came the players’ strike in 1994 — I was convinced at the time that this was a conspiracy against Canada, given that the Blues Jays led the American League and the Expos the National League when the strike was called — and I abandoned baseball with the vehemence of a scorned lover. During grad school I went to quite a few Jays games, but my full obsession with baseball didn’t return until recently. No doubt this has to do with the fact that the Blue Jays have been getting steadily better; it also has to do with the gradual diminishment of my all-consuming cycling obsession. Whatever the cause, this summer has been all about baseball. From early June to early August, I caught pro ball games in five stadiums on two continents. Here’s a quick rundown. A welcome sight after a long rain delay. An incredible sky rewards my patience. 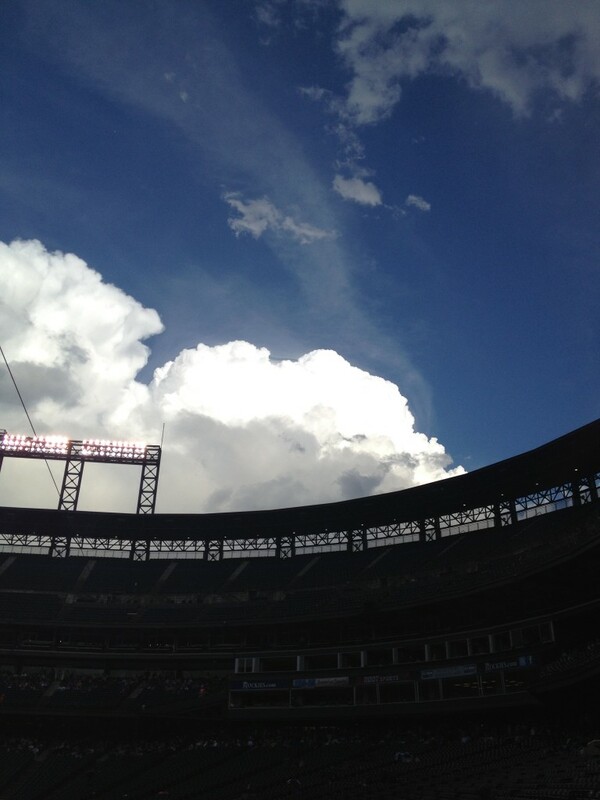 The fun started at Coors Fields in Denver. I was in town for the Computational Linguistics for Literature Workshop at the North American Association for Computational Linguistics conference. As genuinely thrilling as this workshop was (easily the highlight of conference circuit this summer), I did have a bit of time to kill my first night in town. My hotel was a few blocks from Coors Fields, so after checking in, I took a walk to the box office and treated myself to a relatively expensive seat on the third base line. When I went back to the hotel, I turned on the TV and saw that there a thunderstorm warning in effect for the Denver area. I’d been a bit hasty in buying my ticket. A few minutes later, apocalyptic thunder and hail descended. I stayed in my room watching the rain delay on ESPN until finally I decided to get at least a stroll around a reputedly beautiful baseball stadium out of my ticket. 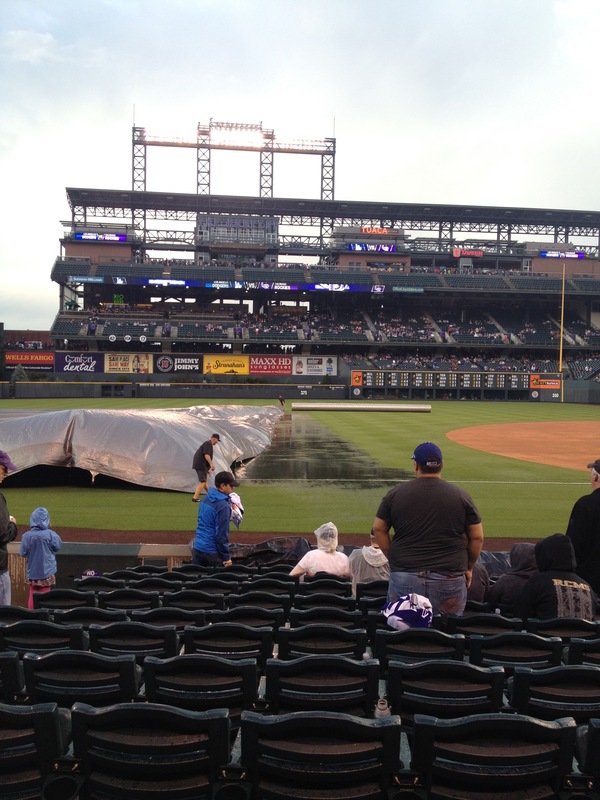 I walked to Coors Field in light drizzle and when I arrived it wasn’t raining at all. For a while it looked like they’d start to play. Then it started hailing again — dangerously massive pellets. It took a while, but they finally did start to play eventually. The highlight for me, besides the bizarre and beautiful post-storm Denver sky, was some choice hitting and fielding by Troy Tulowitzki. A little more than a month later, he was a Blue Jay. In Tokyo, every major attraction attracts more attractions. 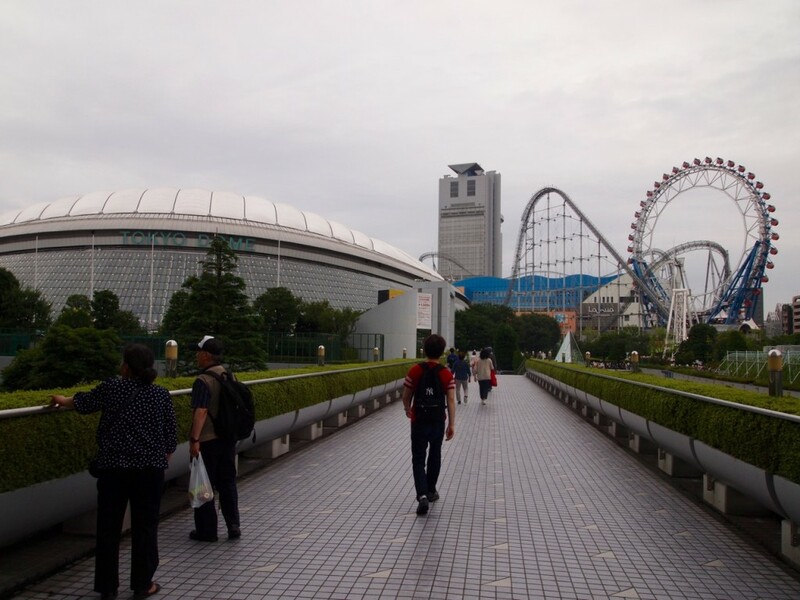 Hence, Tokyo Dome City. In July I went to Japan. The second night there, I headed to the Tokyo Dome to catch the New York Yankees of the Japanese league, the Yomiuri Giants. Everything about Japan was new to me at the point, but a few things about the game stood out particularly. First, the visiting team’s fans were amazing. 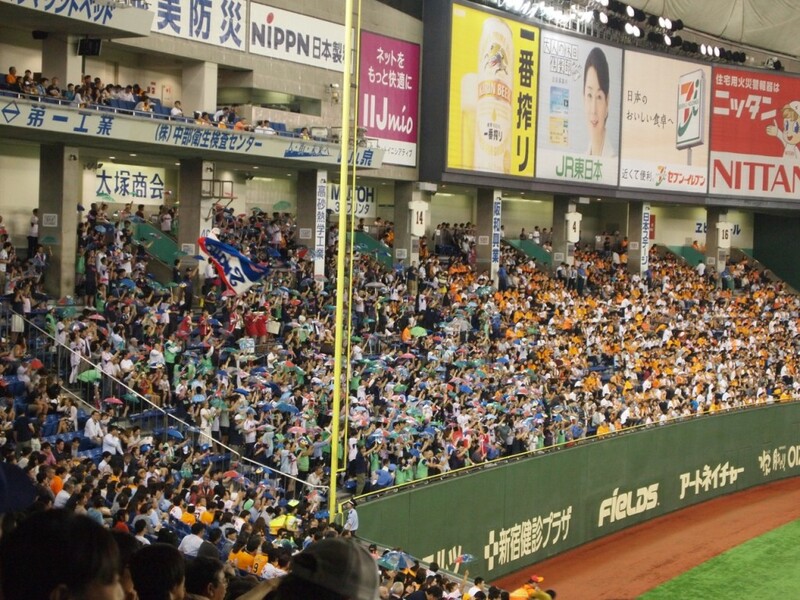 The “away” team was actually the other Tokyo team, the Yakult Swallows, so the fans didn’t have far to go. But they were there in force, occupying an entire section of the outfield and singing songs and playing trumpets whenever their players were at bat. I couldn’t help but root for the Swallows (who were obviously the Japanese Mets.) Second was the Tokyo Dome itself, much uglier even than Toronto’s Rogers Centre and yet much more fun. Domes are necessary given the length and sogginess of Japan’s summer rainy season. 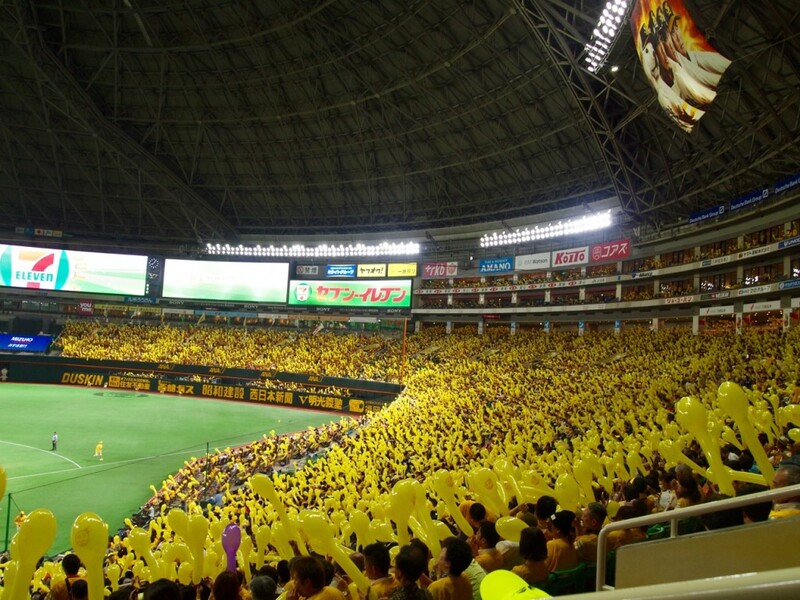 Japanese baseball has adapted to the sterility of domes by interspersing the baseball action with lots of singing and dancing and endless on-field activities. I was riveted throughout. Finally, the swag at Japanese games is incredible. The gift shops were endless and filled with all the Snoopy, Hello Kitty, and Moomins-themes Giants gear you could ever want. 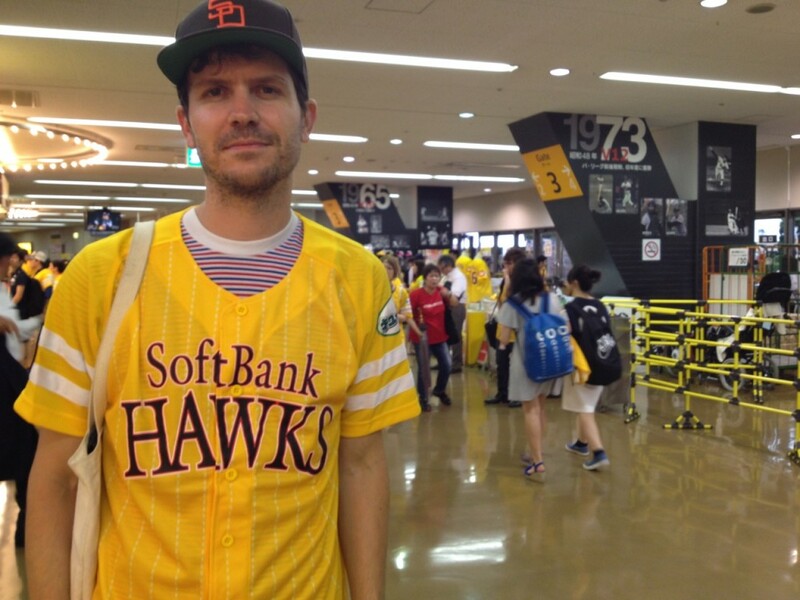 A few weeks later, I went to see the league-leading SoftBank Hawks in Fukuoka’s Yafuoka! Dome (the sponsor of the dome is Yahoo! — what a weird stadium name, mixing city and sponsor together!) This turned out to be the baseball experience of the summer. I went without tickets, thinking I’d be able to pick one up at the gate. (With the exception of the Giants, it is very tricky to buy baseball tickets in Japan if you don’t speak or read Japanese.) It was pouring rain that night, but as I approached the dome, the massive crowds lined up at the gate spelled trouble. Sure enough, at the ticket booth I learned the game was sold out. That’s when my guardian angel manifested itself in the form of a very friendly season ticket holder who offered me his tickets for free. The seats were terrific — just to the right field side of home plate. And that night turned out to be Free Jersey Night (that explains the sellout), so I got a pretty snazzy jersey with my free tickets. The game was great and the Hawks prevailed. The fan culture was astoundingly cool. During the seventh inning stretch and after a Hawks win, fans all release special balloons that release a loud whistle as they deflate (see video). Another Hawks fan was kind enough to offer me one of her balloons, so I got to be part of the fun. I’ll never forget that game, and the Hawks will always be my Japanese team. Hard to beat the view at Petco. 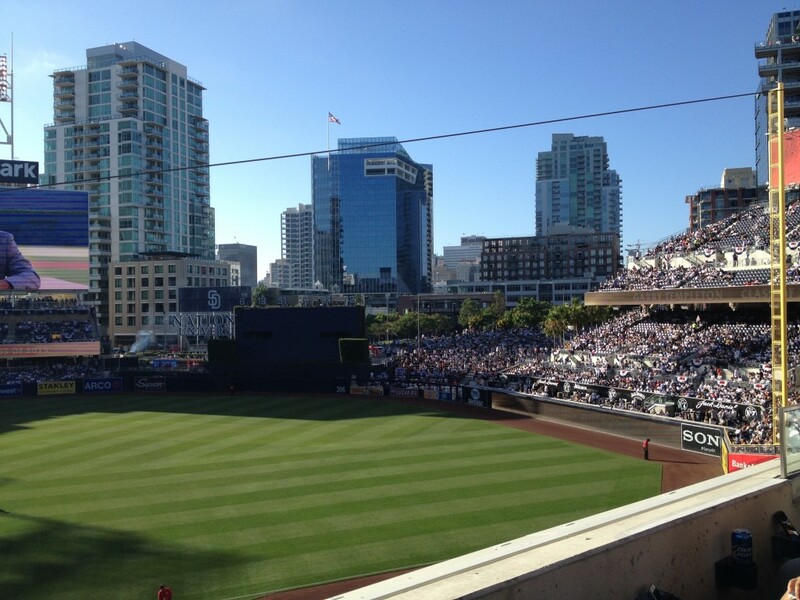 The first thing I did when I landed in San Diego was go to a Padres game. It was another Free Jersey night — I scored a massive XL Benito Santiago jersey, the only size they had left — and the stadium was packed. Petco Park earns a tie with Coors Field for the prettiest field I visited this summer — but the Padres were pretty awful that night. (I went back a few days later, and they were equally awful.) I’ve always liked the Padres, partly because they entered the league along with the first Canadian team, the Expos, in 1969. But beyond some nice line drives by Jeff Gyorko (mostly caught, but always well-struck) and some heroics by Justin Upton and Matt Kemp, there wasn’t much to get excited about. Luckily it’s easier to change a roster than a stadium, so I’m hoping for better things from San Diego baseball in the future. It’s been an exciting summer of baseball. I have a feeling that my enthusiasm will once again be rewarded with a big Blue Jays postseason. Thanks to the wonders of MLB.tv, I’ll be watching it all from my living room in Hillcrest.